Gold has been a whipsaw of activity over the last 7 years as the response to the financial crisis drove speculation that inflation would surge and fiat currency would be decimated thanks to the balance sheet expansion of the globes major central banks. However, these fears were mostly unfounded as evidenced by the data and the subsequent price action in gold which retreating from record highs on a dollar-denominated basis. On the topic of inflation, many advanced economies are involved in the ongoing process of fighting potential deflation, not necessarily worried about the metric making a sharp reversal higher over the near-term. However, with volatility back on the uptick and uncertainty about the global economic outlook making a comeback, investors are once more renewing the safety bid, pushing gold back to highest levels since early 2015. After years of slipping lower following the epic rally following the last financial crisis, gold is once more on the march higher, boasting one of the best quarterly performances in years in the first quarter of 2016. The precious metal notched gains of 16.06% in the first three months of the year, returning 17.88% year-to-date. This move has largely coincided with the renewed losses in the US dollar, with the US currency tumbling from its pre-normalization highs over the last few months. As the probability of another rate hike in the first half of the year continues to decline, there is the heightened speculation that the Federal Reserve might have to backtrack after proving it could lift interest rates off of zero. Additionally, other central banks including the European Central Bank and Bank of Japan continue to add stimulus and expand the monetary base, driving up demand for gold as a hedge. As the global economic outlook continues to weaken as evidenced by the near monthly revisions from the IMF, the rationale for holding gold has shifted from inflationary hedge towards wealth preservation at a time of growing forward-looking uncertainty. This uncertainty is further reinforced by the World Bank which has underlined the major “downside risks” to the forecast in spite of expectations that global expansion will outstrip the 2015 rate after slowing to 2.40% from 2.60% in 2016. As a risk aversion mechanism, gold has shown its merits, and its strong inverse correlation to the US dollar means that any more downside surprises in US macroeconomic data could spell another surge in gold that could see prices revisit the $1300 per troy ounce level. A pickup in the safety bid could precede another round of turmoil in financial markets are investors run for cover. Although fundamentally there is a strong case for further upside in gold prices, there are a few factors that could snuff out the existing rally higher and reversal in the prevailing longer-term downtrend. The main factor to watch is the Federal Reserve. The expedited meeting being held by the FOMC could be a precursor to an additional rate hike in coming meets, a policy shift that would likely contribute to a stronger dollar, thereby denting gold prices owing to their historical correlation. 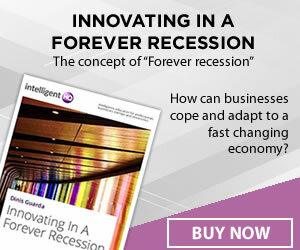 Additionally, although inflation is creeping higher in the United States, it remains below the Federal Reserve’s desired 2.00% target, contributing to less of a need to hedge against the appreciation of the US dollar over the near-term. Should headline consumer prices and personal consumption expenditures pickup and match or exceed the Fed’s goal, it increase the need to hedge against higher inflation to preserve wealth. The most recent price action in gold suggests that there is a renewed safety bid developing amid the continued revisions lower for the global economic outlook. Prevailing conditions indicate that accommodative monetary policy measures are failing to produce the desired results, seeing increased demand for risk aversion assets such as gold. However, this comes after several successful years of downside momentum in gold prices. After snapping out of a multi-year downward trending channel that developed starting back in 2013, gold is once again on the march higher. 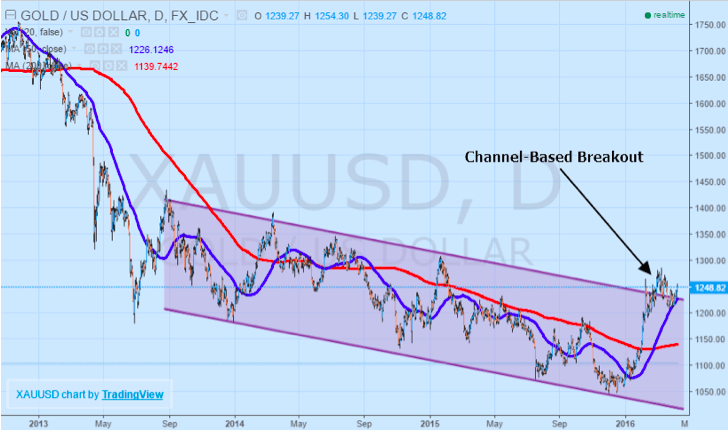 Although the channel traditionally has a very bearish bias, the upside breakout paves the way for renewed momentum higher in the precious metal. Channel-based breakouts, in comparison to range and triangle-based breakouts, are conventionally offering the best reward characteristics if they come to fruition. 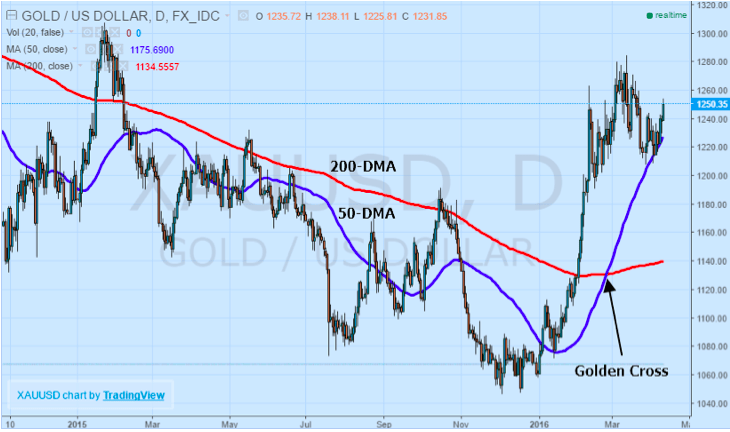 While price momentum higher has been slightly subdued owing to the cautious outlook on policy and the trajectory of the global economy, there are a host of technical factors that are overwhelmingly supportive of a continued reversal higher in gold prices. The most bullish aspect of the indicators was the emergence of the “golden cross” technical pattern back in February. Typically, a signal that is formed once the more medium-term 50-day moving average crosses the 200-day moving average to the upside with both moving averages trending higher, this pattern is historically accompanied by substantial upside momentum. To put this setup in perspective, the last time this golden cross pattern emerged in 2009 the price of gold rose by 100% within 3-years. With both moving averages trading underneath the price action, they will serve as support for any potential downside pullback in XAUUSD. 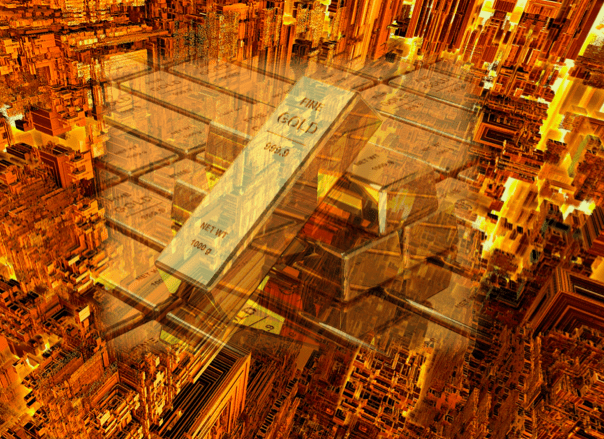 Gold’s continued ascent hinges on a number of factors, most notably US monetary policy, downside macroeconomic developments, and turbulence in global financial markets. Even though many of the attributes for a continued rally are already in place, notably the weakness in economic data and the possibility of additional accommodation, there are several risk factors that could derail any sustained uptrend. Should the US Federal Reserve decide to take a more hawkish approach to policy, the movement in the US dollar could send gold back below $1200 per troy ounce. However, with inflation on the pickup and limited probability of an interest rate hike, the downside case for gold prices is limited at best considering the narrative remains largely bullish absent more positive developments.